Gray whales are amazing long-distance travellers, undertaking migrations of thousands of kilometres each year. 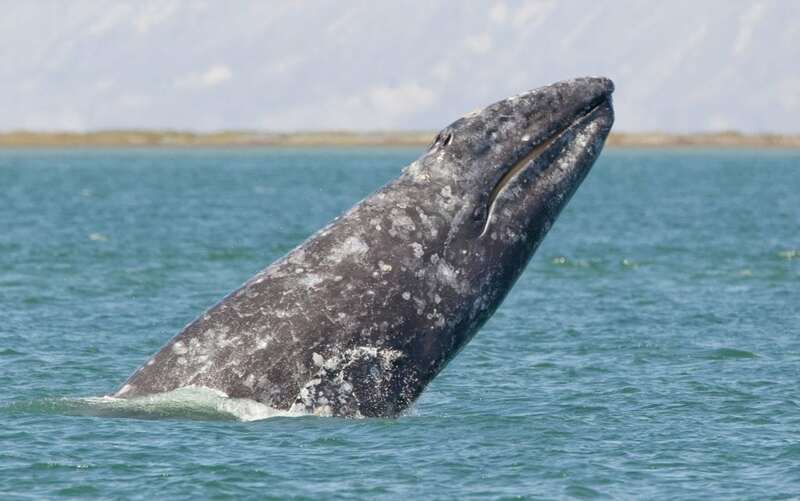 Gray whales were the attraction on the world's first ever whale watching trips in the 1950s and today still attract thousands of visitors as they migrate up the west coast of North America each spring. 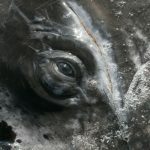 What do gray whales look like? Unlike any other large whale! As their name suggests, gray whales are grey in colour – although a more marbled than plain grey – with a relatively small, narrow head, which arches distinctively between the blowhole and snout. They have a robust body and flippers which are small and paddle-shaped. Instead of a dorsal fin there is a low hump with ‘knuckles' between the hump and the tail. Gray whales usually also have huge amounts of barnacles and whale lice attached predominantly to the head and body. What’s life like for a gray whale? As far as the north western Pacific population is concerned, we don’t really know, except to say that it must be similar to those in the eastern north Pacific and involve long migrations from warm to colder waters and back again. In summer it’s all about finding as much food as possible, and fattening up before embarking on a long journey south to warmer waters where it’s all about breeding and rearing their young. Once the calf is ready and the blubber reserves depleted, it’s time to head north again, back to the feeding grounds in the cooler waters of the north. This part of the journey is a dangerous time for gray whales as orcas lie in wait, ready to attack and feast on their nutritious young calves. If they can successfully run the gauntlet, it’s back to finding as much food as possible and avoiding the hunters' harpoons. Gray whales are bottom feeders, consuming a wide range of benthic and epibenthic invertebrates. They hunt seabed creatures by rolling over on one side then swimming slowly along sucking up sediment and the small creatures that live in it. They then sieve out the water and silt through their baleen, trapping the food behind. Most gray whales turn on their right side to feed (but like humans some are 'left-handed') and as a result, the baleen on the right side is usually shorter and more worn than the baleen on the left side, and the right side of the head is more scarred from rooting around on the bottom. Where do gray whales live? 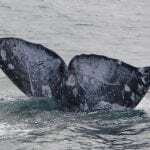 Gray whales are the most coastal of the large whales, rarely venturing more than 20 – 30kms offshore. They are found predominantly in shallow coastal waters of the north Pacific Ocean. 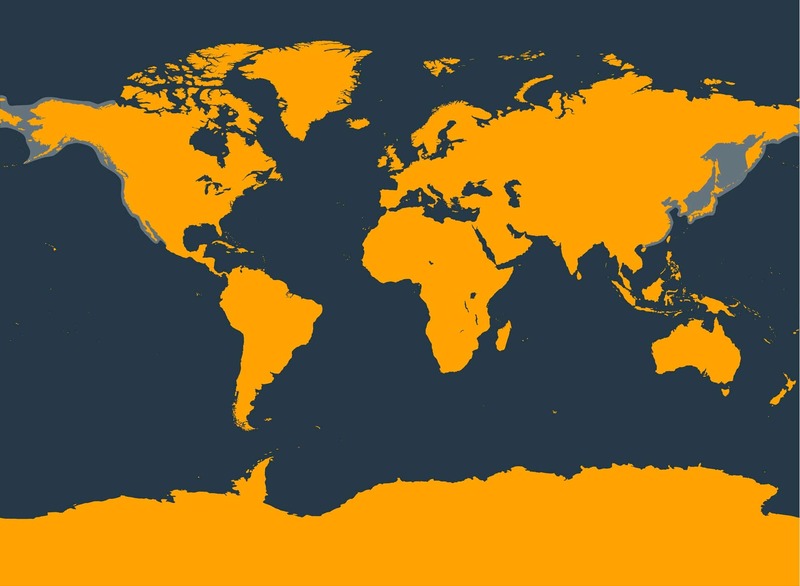 The larger eastern north Pacific population summers and feeds mainly in the shallow waters of the Chukchi and Beaufort seas, and the north western Bering Sea; a few also summer and feed along the Pacific coast from Vancouver Island (Canada) to central California (US). The population migrates in autumn along the coast to winter breeding grounds on the west coast of Baja California (Mexico) and the south eastern Gulf of California. The much smaller western subpopulation summers in the Okhotsk Sea. The major known feeding grounds are off the north eastern coast of Sakhalin Island (Russian Federation), but some animals are occasionally seen off the eastern coast of Kamchatka (Russian Federation) and in other coastal waters of the northern Okhotsk Sea. This population's migration route is not well known. 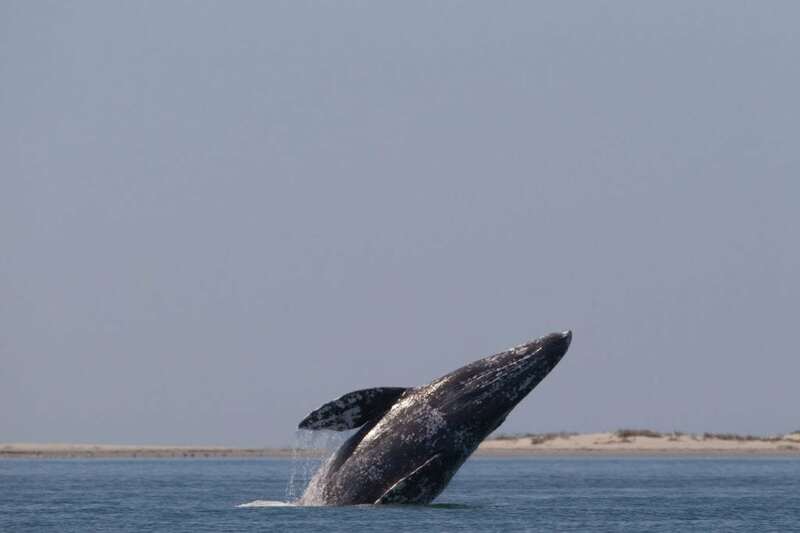 Gray whales undertake one of the world's longest migrations, making a yearly round trip of 15,000-20,000 km. 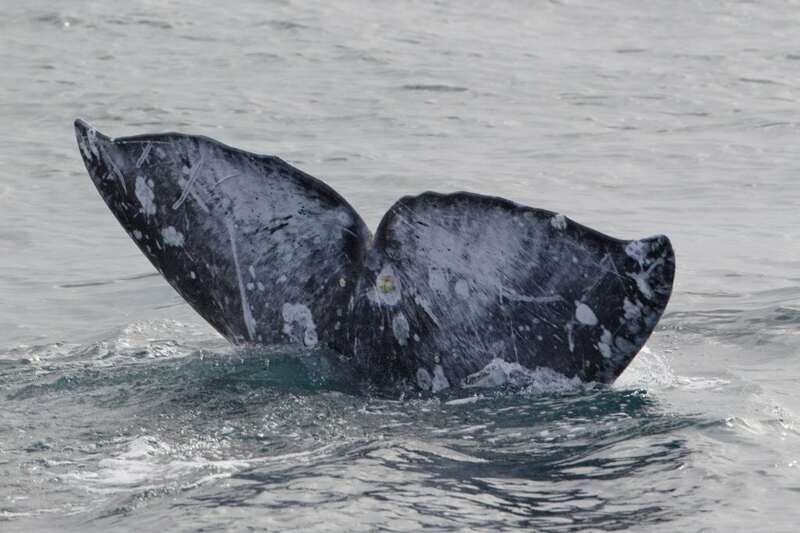 Although the remaining populations of gray whale were thought to be relatively isolated from each other, recent data shows that at least some of the whales in the western population actually migrate all the way round the rim of the Pacific and down to Mexico. Gray whales used to be called ‘devil-fish’ for allegedly attacking the boats of those hunting them, which may have been partly due to defence of their young. They have been hunted for thousands of years but it was commercial whaling that had the biggest impact. By the end of the 19th century it had become commercially unviable to hunt gray whales and during the 20th century numbers recovered as the whales were afforded protection. Today, the International Whaling Commission allows a number of whales to killed by aboriginal hunters in Russia. Between 2013 and 2018, the native people of Chukotka were allowed a total catch of 744 whales (with a maximum of 140 in any one year). Historically there were three populations of gray whale, however the north Atlantic population went extinct in the 18th – 19th centuries for reasons unknown. 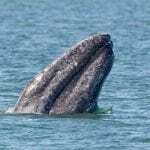 In recent years, there have been sightings of gray whales in locations as remote as off the coast of Israel in the Mediterranean and Namibia in Southern Africa. It is thought that these are just individuals from the Pacific that have made their way through the arctic as reduced ice distribution makes the Atlantic Ocean more accessible. 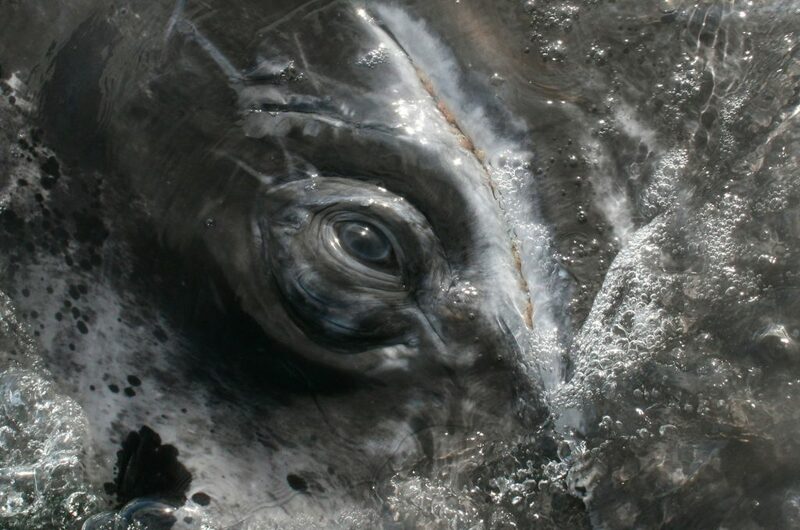 Even though their numbers have recovered gray whales continue to face numerous threats. Hunting – between 2013 and 2018, the native people of Chukotka were allowed a total catch of 744 whales (with a maximum of 140 in any one year) from the eastern north Pacific gray whales sub-population. Pollution - toxic chemicals from plastic, litter and oil spills build up in gray whales seriously harming their health and their ability to have young. 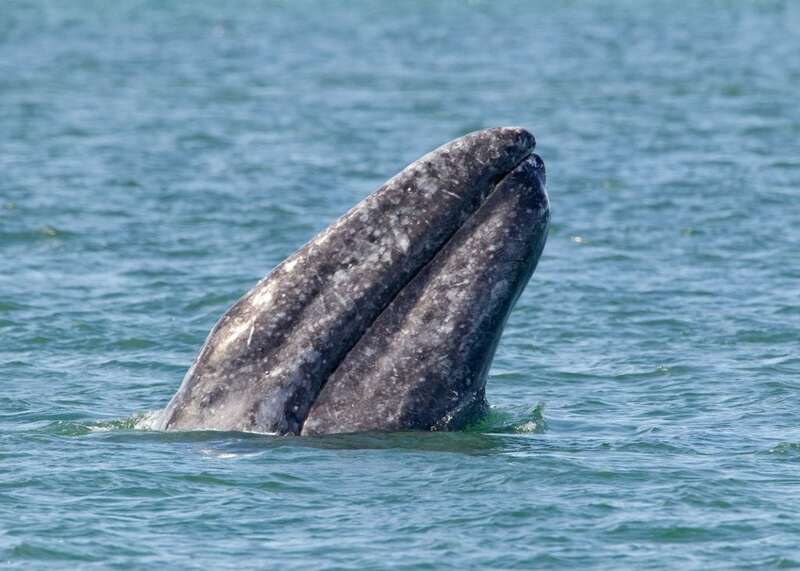 Noise pollution – gray whales rely on sound to navigate and communicate. Noise from military sonar, oil and gas drilling and exploration and shipping can disrupt and confuse them and even cause them to strand. Entanglement in fishing gear – gray whales are vulnerable to becoming entangled in fishing gear and either swimming off with it still attached, resulting in a slow, painful death, or becoming anchored to the spot, left to suffocate and die.